Last night I went to Roti King in Euston, with my friend Oli from Barcelona. Oli is in town for a mass portrait shoot tomorrow (27th June) where we will photograph 100 plus people for a book, somewhat like the one we did in Barcelona a few years ago – Homage to Cataluña. 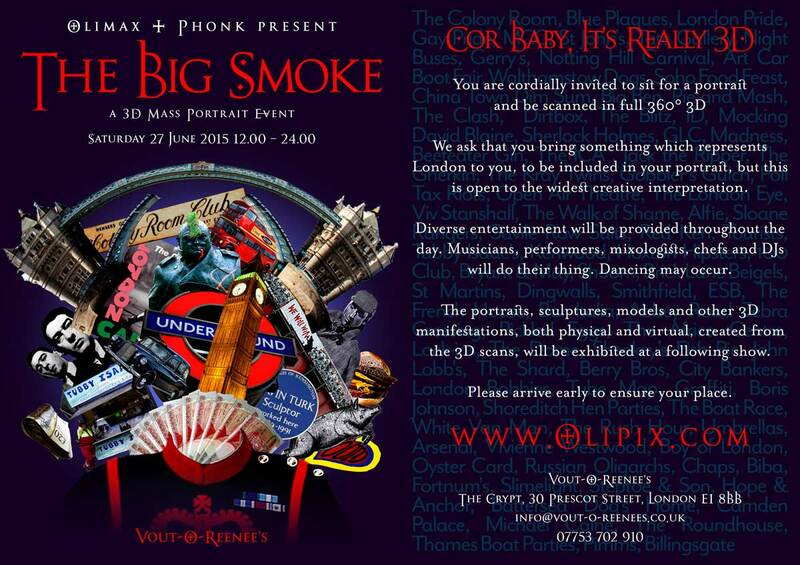 This time the title is The Big Smoke, the theme is London and participants will also be scanned in full 360º 3D by Phonk. All comers welcome with a suitable London theme, at Vout-O-Reenee’s from midday to midnight. Please R.S.V.P. But I digress, so back to Roti King, serving Malaysian cuisine and packing a big punch. I’ve wanted to visit the restaurant since reading this Guardian review some time ago. 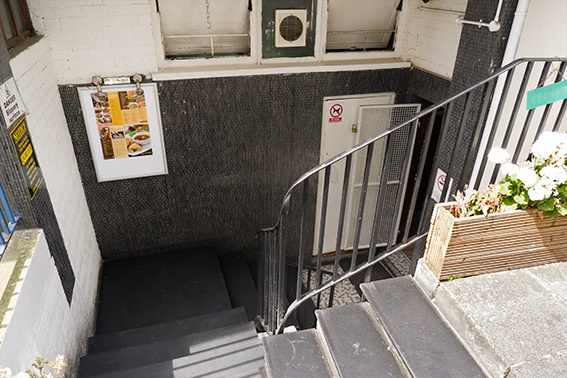 The place is in a drab side street and basement, underneath a block of flats. The interior is plain and the seats have seen better days, however, the service was fast (about 10 minutes) and the food is to die for! There’s space for about 30 people only – we arrived just in the nick of time and got the last table – after that people were queuing on the stairs outside. 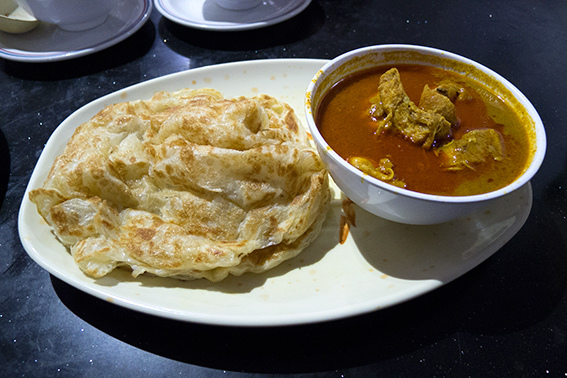 We ordered chicken Roti Canai Special – 2 pieces of roti with chicken curry. Roti Canai is an Indian influenced flat bread found in Indonesia, Malaysia and Singapore. This is similar to the Indian Kerala Porotta. The bread is stretched until very thin, then pushed together like folded cloth before being deep fried in ghee. It’s somewhat like a Mille-feuille nan bread. The curry was delicious and the bread was crisp, flakey and buttery. 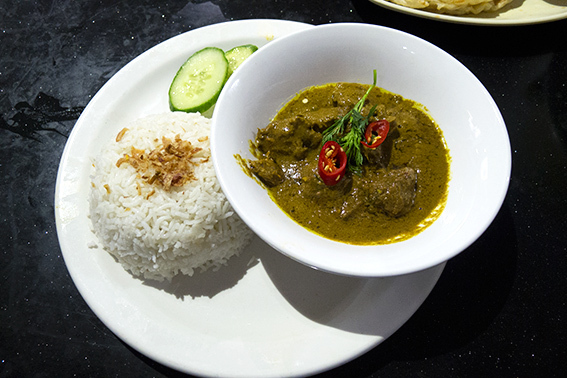 The Beef Rendang is a caramelised beef curry with aromatic spices and coconut. The sauce was thick like golden henna or even mud to look at, but the beef was beautifully tender and melted in the mouth. The dominant flavours in the spicy sauce were coconut, chilli, ginger and lemon grass. We had all the food at the same time – the rendang and the roti came in small dishes, whereas the Kari Laksa came in a huge bowl. 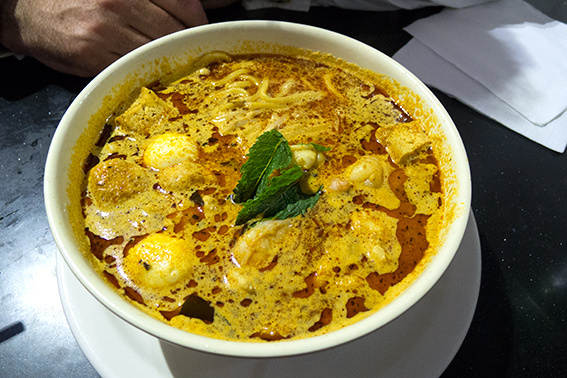 The Kari Laksa contained noodles in coconut curry with seafood and chicken. Little fish balls and tofu poke out of the sauce like dumplings. I’ve had the dish before, but this one blew me away. It was quite hot and spicy, but the chilli was tempered so that just enough taste buds remained in order to savour the fish, lemon grass and coconut. The noodles were excellent and I’d imagine they are made on the premises. All the food was stunning, but the laksa was definitely our favourite dish. The food is very cheap at about £20 for two people and I will be going back for more – I can almost see myself going daily until I’ve eaten my way through the menu! They do BYOB with a £5 cover charge. Apparently this is the only place in London making Roti Canai and possibly the very best in Malaysian food too! 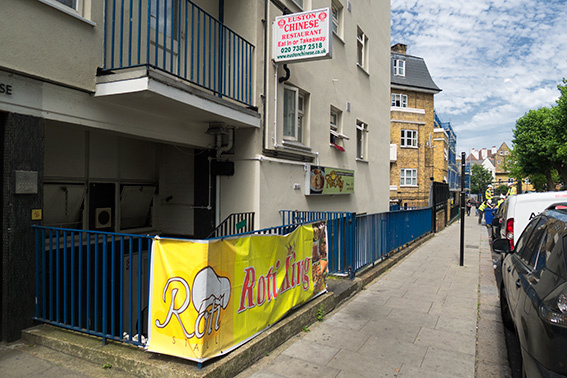 Roti King is at: 40 Doric Way, NW1 1LH (next to Euston Station). 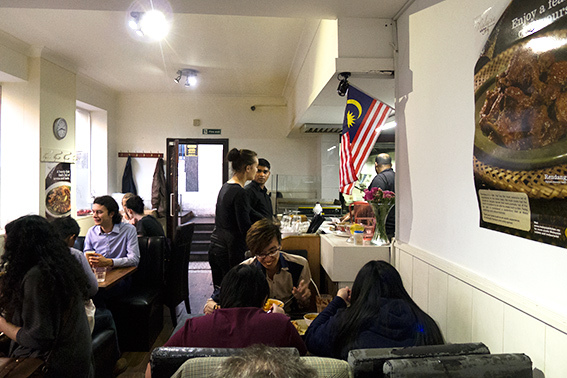 This entry was posted in Eating Out, Fish, Food, Meat, Restaurants and tagged Beef Rendang, Indian, Kari Laksa, Malaysian, Olimax, Phonk, Roti Canai, Roti King, The Big Smoke. Bookmark the permalink. Lucky You & Oli from Barcelona! That meal sounds & looks divine! Thanks for describing it so I dream about it way over here in Western North Carolina. Yum, yum, yum. I so wish we had a Maylasian restaurant here… We’ve been to some in other cities and just loved the food. Lovely to see you posting Mad! Began looking at the Barcelona pics: that was so good but long enough for me to file for tonight: am looking forwards to it! And fair weather and heaps of imagination and all other matters good for the photo-shoot!! The food looks great but more fusion than Malaysian . . .yes, I would like to taste the laksa also . . . best!! Thanks Eha – I’m craving more laksa now! I love Malaysian food. Your pictures look fantastic. I have to make this meals as soon as possible.Thanks for sharing. Thanks Chef Devaux – I’m glad you liked the post.